North American Access Technologies now has a new High Performance, extremely cost effective line of KVM-1 Rack Mount LCD Monitors & KVM systems. 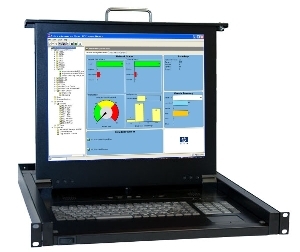 Rack mounted pull-out LCD monitor with keyboard & touchpad. Only 1U high and available in 15' & 17" models. These units also feature a built-in wrist pad and speaker. Manage multiple servers with just one keyboard & monitor, using these matching KVM-1 switches in 8 & 16 ports (which can attach to the frame and does not use up any additional rack space). These units can also be cascaded to support up to 128 servers. Compare these special introductory prices to other vendors products and you will find that these KVM-1 units are an extremely cost -effective way to recover valuable rack space and manage multiple servers.